Enevate, located in Irvine, California, claims its latest silicon-dominant lithium-ion battery technology makes 5 minute charging possible. In a press release, the company says an electric car equipped with one of its batteries can add 240 miles of range in just 5 minutes or 50 miles of range in a minute. 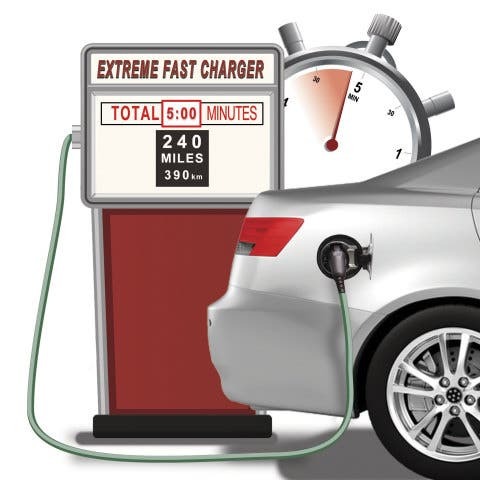 Fast charging is a hot topic in the world of electric automobiles because most drivers are accustomed to spending 5 minutes or less at the pump to fill the gas tank of their conventional cars. Israeli company StoreDot also claims its EV battery can be recharged in just five minutes. Enevate cites several advantages for its batteries. Each battery has an energy density of 750 Wh/L and can be safely charged at temperatures as low as -40º Celsius. It can absorb more energy from regenerative braking than a traditional EV battery. Last, the company claims that eliminating range anxiety due to faster charging times could allow manufacturers to offer smaller, less expensive batteries, which would reduce the cost of electric vehicles and make them more attractive to buyers. No less an authority than Dr. John Goodenough of the University of Texas in Austin has given his endorsement to the company’s technology. “Enevate’s film-based silicon-dominant anode and cell is a truly novel approach and great practical fit for use in EVs addressing the major barriers to EV adoption,” he says. Enevate’s silicon-dominant anode technology is exciting news, but the company provides no information in its press release about what sort of charging equipment is needed to make the miracle of 5 minute charging possible, nor does it say where such chargers can be found, who will build and operate them, or how much they will cost.